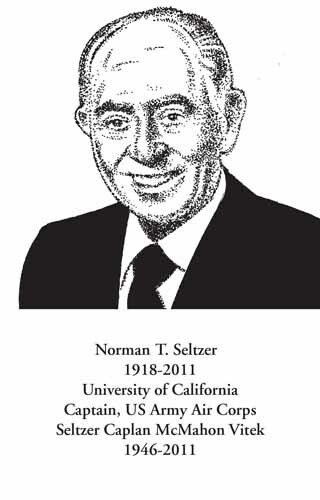 Norman Seltzer founded San Diego’s Seltzer Caplan McMahon Vitek in 1948. With a respected practice, he represented builders and developers on property transactions including the acquisitions of Convair Plant II and the Hotel del Coronado. With a reputation for creating a loyal core of legal minds, both family members and attorneys, have remained on staff for decades. His son Brian Seltzer is a shareholder and chief operating officer of the firm, and grandson Matthew is an associate. Born in Pittsburgh, PA, Mr. Seltzer graduated from Hoover High School in San Diego, received his bachelor’s degree from University of California Berkeley, and his law degree from the University of California College of Law in 1941. In 1942, he joined the United States Army Air Corps as a first lieutenant, serving as a navigator and navigation instructor. By the time he was discharged in 1946, he had achieved the rank of captain. Mr. Seltzer returned to San Diego after the war and before founding his firm was an associate with Lindley, Higgins, Lazar & Johnson, handling a variety of cases including divorce. In his own practice, he specialized in property issues and was adept at going before city councils and government agencies to achieve winning outcomes for his clients. His commitment to his clients, colleagues, family and country extended far into the community as well. He served on numerous boards throughout his life, including the city of San Diego’s Park and Recreation Board, the University of San Diego School of Law, San Diego Community Foundation, and The City of San Diego’s Charter Revision Commission. An avid tennis and bridge player, Mr. Seltzer was awarded the title of Silver Life master from the American Contract Bridge League.